Franco’s artistic creativity and love of Pontito was supported and shared by his beloved wife, Ruth, herself an artist. 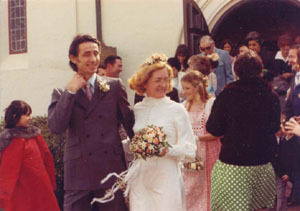 Married in 1975, they owned the Pontito Gallery in San Francisco’s North Beach until Ruth passed away in 1988. Franco closed the gallery and went back to work as a cook to make ends meet. The Exploratorium held an exhibit of Franco Magnani’s work as “The Memory Artist” in 1989 which highlighted Franco’s extraordinary memory by placing his paintings side-by-side with recent photographs of the same scenes, which he had not seen for many years yet had recreated from memory with incredible detail.